The 3rd Annual Susan G. Komen Ocean City Race for the Cure took place on April 13, 2014 and was a huge success! Ocean City was “painted pink”, as many businesses entered into the contest for the best pink decorations. There were many fun events all weekend! Seacrets held a celebration party on Friday, Skate for the Cure took place at The Carousel on Saturday and Planet Maze was only $15 for two hours of unlimited fun! The event also included a timed 5k with awards for top finishers and a 1-mile family walk. One of our very own employees Elaine Zongker had a team and they participated in the event! 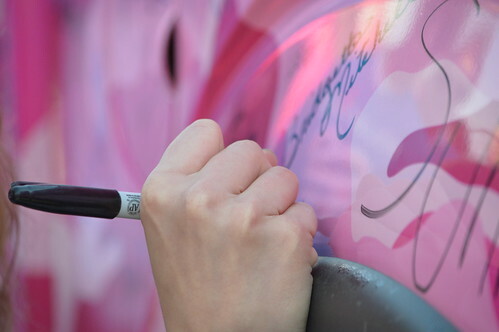 The Pink Drive to Inspire Truck was also at the Susan G. Komen Ocean City Race! 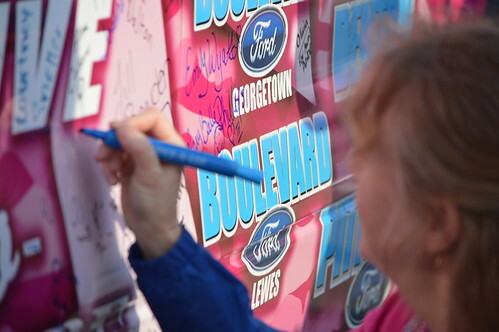 Many signed the truck to support the fight against breast cancer! Susan G Komen has a vision of a world without breast cancer. Their promise is to save lives and end breast cancer forever by empowering people, ensuring quality care for all and energizing science to find cures. Susan G. Komen was established in 1982 by Nancy Brinker to honor the memory of her sister Susan G. Komen who died from breast cancer at the age of 36. For the past 25 years the Susan G. Komen foundation has played a critical role in every major advance in the fight against breast cancer. They have transformed the way the world talks about and treats this disease. Their contributions include; more early detection, more hope, more research, and more survivors. Nearly 75 percent of women over 40 years old now receive regular mammograms, the single most effective tool for detecting breast cancer early. The federal government now devotes more than $900 million each year to breast cancer research, treatment, and prevention, compared to $30 million in 1982! America’s 2.3 million breast cancer survivors, the largest group of cancer survivors in the U.S. are a living testament to the power of society and science to save lives. Without a cure for breast cancer 1 in 8 women in the U.S. will continue to be diagnosed with breast cancer. Also an estimated 5 million Americans will be diagnosed with breast cancer and more than 1 million could die over the next 25 years. An estimated 25 million women around the world will be diagnosed with breast cancer and 10 million could die over the next 25 years.